BRASILIA, Brazil, April 13 (UPI) — Brazilian President Dilma Rousseff could fall victim to a successful impeachment vote in the country’s lower house of Parliament after former coalition allies turned against her. Brazil’s Progressive Party quit Rousseff’s coalition government on Tuesday and said most of its 47 members in Parliament will vote for impeachment. The Republican Party, which also quit the coalition, said its 22 members have been told to vote for impeachment. 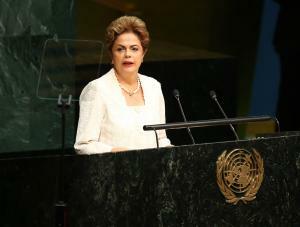 Rousseff said her opponents are planning a coup d’etat against her. She is accused of juggling accounts to make her government’s economic performance seem better than it truly was before she campaigned for re-election in 2014. About 61 percent of Brazilians support Rousseff’s impeachment. Brazil’s lower house of congress — known as the Chamber of Deputies — is scheduled to hold a vote Sunday on whether Rousseff should be impeached. The chamber would need a two-thirds majority — 342 of 513 parliament members — for the measure to be sent to the upper chamber, known as the Federal Senate. A recent poll showed at least 300 Parliament members are in favor of impeachment, 125 are opposed and 88 are undecided or unannounced. The poll was released before the Progressive Party’s announcement that it would abandon support for Rousseff — meaning the combination of Progressive Party and Republican Party Parliament members who could favor impeachment would allow the anti-Rousseff movement to reach the two-thirds majority. Brazil’s Federal Senate has the power to put Rousseff on trial, to suspend her presidency or to remove her from office. The Senate requires 41 senators out of 81 for an impeachment trial to begin but two-thirds of the Senate would be required to remove her permanently.